Billy began life back in the early 1990's when Lizzie's father, Alan, created stories about a bouncy red ball he called Billy. Alan would tell these stories to Lizzie and her two sisters, Rachel and Nicola at bedtime and they all fell in love with Billy. Years later, now that Lizzie, Rachel and Nicola are all grown up, Lizzie decided to introduce Billy with new characters and stories into the world for other young children to enjoy. 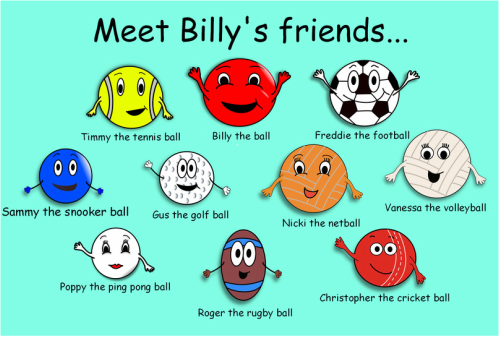 Billy and all his friends are balls from different sports. They all have their own character and personality which make each story such fun to read. The books are aimed at 3-5 year olds but have also been enjoyed by older and younger! Me and my dad ! Billy the ball's big bounce. Billy and friends see just how high they can bounce! Billy the ball down on the farm. Farmer Jack needs some help on the farm! Also available as a colouring book for only £3.75! Billy the ball and the lost pirate. Billy and friends sail out to sea with a pirate! Billy the ball's space adventure! Billy and his friends go out of this world! Billy the ball's woodland treasure hunt. Billy and friends enjoy a woodland treasure hunt, but what will they find along the way? Reviews - You can submit your reviews via our contact page. Mumsnet - The storylines are simple, yet engaging and the illustrations are bright and friendly. Pre-schoolers will love the friendly characters and colourful pictures and KS1 children will enjoy how the story unfolds and helping Billy to solve problems along the way. We hope you enjoy sharing these books with your children as much as we did. Charlotte (ASMR Angel) - After reading the books several times including once in the video, I found it to be super child friendly, loved the cute illustrations and had great fun going a little silly with the accents! Reception class teacher - Hi Lizzie, I just wanted to say how my class loved your first book. They were even drawing new characters for you to put in your stories! Brilliant characters to capture the children's imagination. Michelle - I bought my second Billy the ball book today, Billy the ball and the lost pirate. I just read it to Isabelle and she insisted on me reading your first one too! She is one very satisfied customer! Anon - I bought Billy the ball's big bounce for my six year old son who not only loved the book but also enjoyed his ten year old sibling reading it to him! Thank you. Tim - I bought Billy the ball's big bounce for my nephew and he absolutely loves it. Looking forward to buying the rest of the series. It reminds me of when I used to read Mr Men as a young lad.